My mother-in-law passed away recently, and with that snapped the last link of her generation of relatives from my husband's paternal family. She was addressed as 'chithi' / 'mami' by some but she was 'Komukka' to most and 'komummai'/ 'Paati' / Amma to a handful of us. My grand-kids called her 'kollupaati' (great grand mother). Apparently she had her share of rough years and tough times in the initial years of her marriage when my father-in-law was still studying for law. Once he had established his practice there was no looking back. She would tell us how she used to slog it out in the early years but we would find it hard to believe as we had only seen her leading a royal life with cook and servants to help. She was fond of shopping and was very generous, selfless and patronizing and my father-in-law never questioned her. 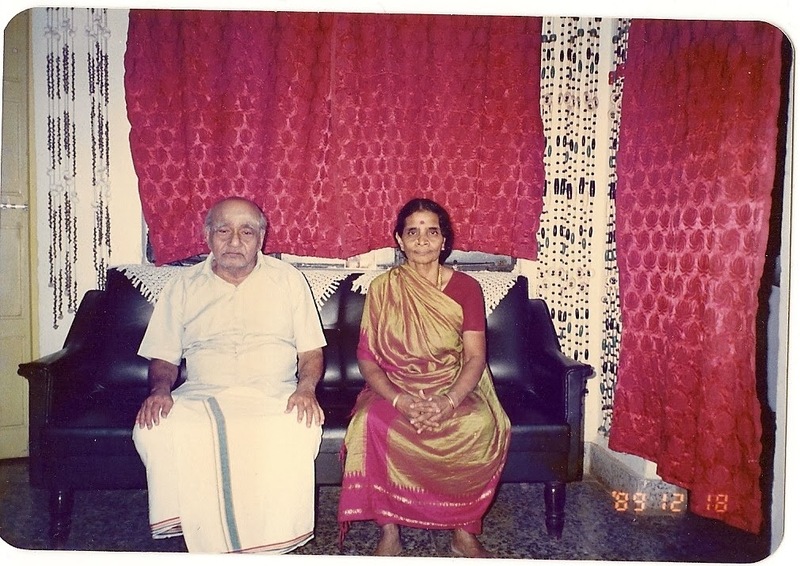 Both of them naturally had a great attachment for Kottayam which had given them so much in life. 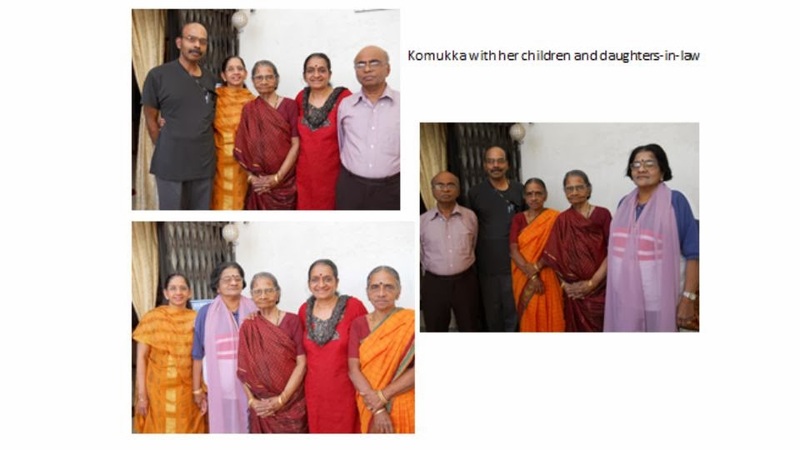 Even after leaving Kottayam after 'retirement', both of them had nothing to complain about as they spent their lives with one or the other of their four children. She lived for 18 years after father-in-law's demise, and during the long years she was with us, she was in good health - a blessing not only for her but also for all of us. Even at 90 she managed to do her daily rituals independently and walk about at home. She would stay put at home with no exercise at all. (Health-freaks, please note! :) ). No amount of coaxing would make her step out for even a short walk. She was lucky she had not even the common health problems like BP / diabetes. She had taken good care of her health, rested well and had healthy eating habits - not a big eater, rather frugal and fastidious. Her favorite items were curd rice with 'naarthanga pickle' and of course coffee. She would not touch anything that wasn't made at home. During family get-togethers, when the rest of the family would gorge on chana-bhatura / 'vengaaya sambar' - potato roast for lunch, she would be happy with a simple 'molagooshiam' / easy-to-make 'payaru puzhukku' and rasam. She maintained a schedule and that kept us in the groove too. Our outings would be planned so that we'd be home by noon / before 7 pm. When we'd be away for our evening walks it would be time for her favorite serials on Asianet - she used to handle the remote herself till the set-top-box era set in. She would get confused with the two remotes, so we'd switch on the channel for her - before time - while we were going out. My niece couldn't help laughing at grandma's enthusiasm in sitting glued to watch the vicious mother-in-law in 'Sthreedhanam'! In the mornings her staple 'watch' were the serials on Sun TV. She had her own spot on the sofa - in fact whenever my friend's little girl visited us,she would ask about 'ammumma' whenever she found the spot unoccupied! 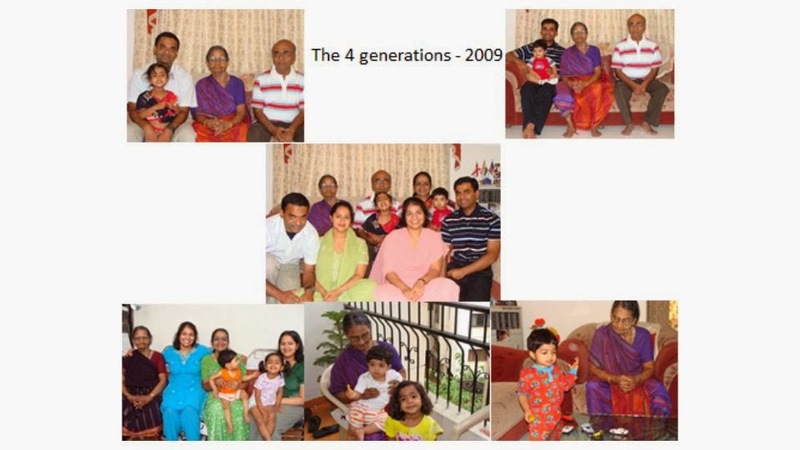 Amma was a 'madisar mami' till almost the end - even when she spent nearly two years in the US. Only on two occasions when she had fractures did she slip into a nightie - and yes also in the last four months. She would maintain her 'podavai' (longer sari) so neatly folded that they would appear to have been ironed after each use! My grand kids would gaze in wonder at the way she was draped in the 9 yards 'podavai'. They would sit next to her on the sofa and watch stuff on the iPad / play / read - giving running commentary to Kollupaati in English. She wouldn't understand a word and just be quiet. The kids would be puzzled about her silence and keep casting glances at her. I would explain to her what they were saying and she would say, "chamathu kutty". 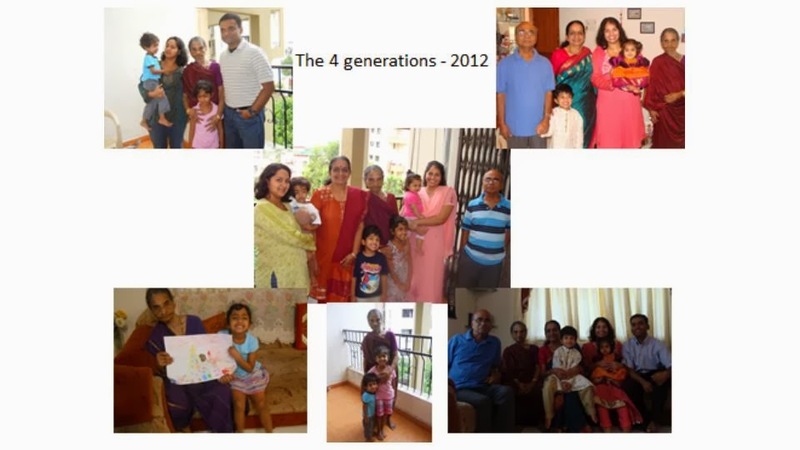 In fact this year my older grand kids asked me how old kollupaati was and on hearing '92', they started calculating and said we should have a grand celebration for her 100th birthday after 8 years! That was not to be. The great consolation is she didn't suffer much and had a peaceful end. May her soul rest in eternal peace! Oh that is so sad to hear....i have fond memories of her from our Ajmera days....May her soul rest in peace. i remember meeting her too aunty when i visited your place with pallavi a couple of years back. May her soul rest in peace.take care. Yes Meera, I remember! When Tata's shampoo vanished from the market, she switched over to Hair & Care rather reluctantly! Oh yes, I have forgotten to mention about her hair - she had less grey hair than me (in 'undyed' condition! We remember patti was sitting on the sofa placed herself on a corner all the time., talking sometimes.. mostly replying for questions well...in your hall. And uncle's reply to Ashu was amazing for her query 'where is "Ammumma"?....Jesus said there is no one to make sambar in heaven., so he called come and make sambar ..so she went to heaven"